Revisiting this month’s Christian Marketplace, I was encouraged to see Jonathan Brown, Kingsway’s Business Development Director, responding to Robin Henderson’s questions about Christian CD prices in the Letters section (p.4, April & May issues). It really is about economy of scale along with people’s perception to CD retail prices, which is driven by The UK’s Top 40 and more importantly supermarket pricing. Supermarkets continue to use CDs and entertainment product as a loss leader and to drive footfall. Jonathan is undoubtedly right in his observations about the supermarkets — except that in our sector of the marketplace, it’s not usually the supermarkets we’re competing with: how often do you see Kingsway or other Christian label CDs on sale in UK supermarkets? The odd one might break through from time to time, but they’re few and far between. So who is driving the public’s perception of Christian CD prices? Amongst others, Kingsway themselves: in this very same issue of Christian Marketplace, we have a three-page feature introducing Graham Kendrick’s new album, The Very Best of Graham Kendrick: Knowing You Jesus along with a half-page ad telling us (and any of our customers who happen to be reading) it’s “available from kingswayshop.com”. The feature gives the price as £12.99 — but when we visit kingswayshop.com we find it listed as “Our Price: £10.99, RRP: £14.99 (You save 27%)”. Whose price, sorry? Kingway’s. Whose RRP? Kingsway’s. And that 27% discount is only a slim margin off their standard trade discount. I’ll run through that again: Kingsway set the RRP at £14.99 then say “Our Price: £10.99” — and it’s not just the new Kendrick album, it seems to be almost every album Kingsway produce: Kingway’s Price v/s Kingsway’s Price. Having to compete with our own suppliers is nothing new, of course, but it does seem a tad disingenuous of Kingsway to argue that the supermarkets are driving the public’s perception of CD prices — and running loss leaders to drive footfall — when Kingsway are doing the self-same thing with their own products and their own shop. 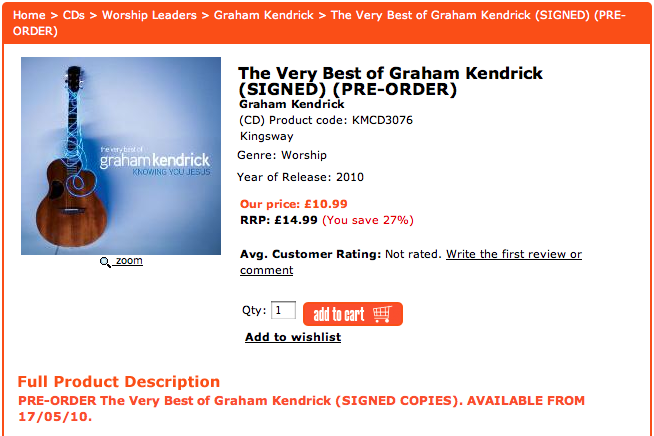 Kingsway are not alone in driving the public perception of Christian music prices down, of course: the Kendrick article is supported by another half-page ad, one that we’re all well-used to: Cross Rhythms, offering the new Kendrick album for £9.97, their regular CD price. But competing with another retailer, even one as prominent as Cross Rhythms, is a different ball game to competing with a publisher slashing their own prices in order to attract direct sales. If £14.99 is Kingsway’s “Recommended Retail Price” on what basis is that recommendation made? And on what basis do Kingsway disregard their own recommendation? No: the RRPs with which we must compete are the Real Retail Prices: the actual prices at which Kingsway sell their products direct to consumer — which surely reflect their true value? Or are we to believe that Kingsway are running loss leaders on their entire product range? The good news, however: Kingsway have extended their offer of free carriage on all UK trade orders to the end of May. My thanks to Kingsway for this and to James Batterbee for clarifying this point. It’s interesting to note that Amazon take action against publishers who do exactly the same thing. If a publisher offers an item on their own website at a lower price than their stated RRP, Amazon take that lower price to be the “real” RRP when calculating the money they will pay to the publisher. Amazon, of course, are in a very different position to most of the retail trade, particularly in our sector. I’ve already sent a letter to Clem on this subject but will wait to see if it gets published. I had a strong disagreement with Jonathan on this a number of months ago. Good news, Michael: your letter has been published: Christian Marketplace, June 2010: Letters: Actions speak louder than words. Agreed. Kingsway’s pricing has been making me very angry over the past few months. If they are selling an item for 12.99 and continue to do so for a long period of time, then the Publisher’s price, as used by the rest of us, should be 12.99, not 14.99 as quoted. If Kingsway are selling stuff at 27% off, and only giving shops 35% off the RRP, then in fact we are only getting 8% discount. Hardly an incentive to sell Kingsway’s products. Furthermore, it is a mockery when Amazon have many Kingsway CDs listed for LESS THAN THE PRICE WE PAY AS RETAILERS. Of course, the public think we are ripping them off, because they’ve seen them much cheaper on Amazon. Come on, Kingsway, play the game. Unless, of course, you don’t actually WANT any retailers to survive……. Agreed. 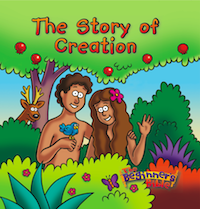 We have only been in the Christian Booksellers market now for 2 years and we have quickly seen our biggest competitor is the Christian publisher/supplier. Kingsway continue to be a big competitor to Christian Book shops with their aggressive online Kingsway shop prices. These prices do undermine the Christian bookshop prices especially when we are encouraged by Kingsway Area Sales Managers to stock the latest Kingsway music offers, dumpbins and point of sale. Kingsway need to re-examine their route to market policy and pricing policy before losing the Christian bookshops, and then they will not have the public platform they require in the high street. ha – do you expect a response of any substance Phil or perhaps you will be “silenced” on this one? We used to stock all the latest music in our 3 shops, but now only get to order, as downloads have killed off a lot of the young peoples market, and suppliers selling to public for prices similar or even less than trade, have decimated the remaining sales. We now have to sell music for less than we paid for it, just to clear it off the racks. Seems to me, Kingsway & others are killing their own sales. There was a time when wholesalers were just that, leaving room for us poorly paid retailers, now they are acting like our competitors, whatever happened to Christians co-operating with one another! Check out in a concordance the references to “one another”. when wholesalers talk of the economy of scale, giving high spenders a better price than the small guy, well it sounds to me like turning Christianity on its head. maybe they should ponder on the scripture,”despise not the day of small things”. I have been in the Christian book trade for two and a half years and though I have been in retail for over 30 years, I have never come across something so lacking in Christian virtue as our own trade. I have Oli Proctor from Kingsway coming to visit me very soon, I shall of course enquire about the pricing and discount strategy, and of course shall expect any items being sold in to me to be at the Kingsway shop price less my standard discount if I am expected to stock them in store – or of course I shall be happy to accept full SOR terms with no minumum quantity levels and with at least 37.5% discount and with a minimum of either 90 days payment terms (oh actaully given how long it seems to take Kingsway to process credits these days that may need to be payment with return for sold items!) so as to act as a high street shop window for kingsways store! I did have a phone conversation with John P not so very long ago and raised these issues with him along with others. I have to say I was appreciative of his time and his position, and at the time it seemed that there might be some ground we could mutually share in order to support one another and I was filled with hope, this hope though is now waning. However let me say clearly though that the people working for Kingsway and often in the front line are wonderful people, Oli and the telesales team are friendly, polite, considerate and try to do the best they can, it is a shame they seem to be so let down by the systems and masterplan at work – they do have my continual blessings and prayers, as do the leaders and management at Kingsway. I find myself praying continually that those in our trade will see the light and realise that Christian comes with a certain code of behaviour. If this cannot truly be honoured then it is, to my mind, better to be honest and say these are Secular businesses that produce material for a Christian market, rather than trying to say and infer they are ‘christian companies, retailers, distributors, charities, shops, chains etc’ because many honest Christians buy from them because they believe they are Christian and that as such they are supporting a certain etho’s and mission that is perhaps not in fact the case when it comes down to the behaviour as witnessed to above. Certainly this is the response from folk visiting my shop when they say they are still supporting a christian shop when they buy directly online because it’s cheaper and don’t understand why we in store can’t match the price, because after all christians wouldn’t do that to each other would they! Just adding two penneth from a distributor/producer point of view. I do not endorse Kingsway’s undercutting of the trade and at Lindisfarne Scriptorium we don’t do that. I would like to explain our costings. We produced a CD last year by Dave Bainbridge and David Fitzgerald (founders of the band IONA) and soloists in their own right. To make the production even remotely cost effective we had to have 3000 units produced. The total cost worked out at £11,868 (covering the guys writing and recording, mastering, mcps royalties, artist royalties and production) which results in a cost price before any advertising of £3.95 a copy. We set the retail at £14.99 to allow us to give up to 40% discount to the store selling the CD so they make £5.99 per CD and we make £5.00 per CD. So far we’ve sold about 750 copies, nowhere near enough to cover our costs and that’s just on one CD. All of the Christian marketplace has had to change as society has changed but one thing must be kept the same. Christ must be put in the middle of all of our dealing with each other. Producers rely on retailers for sales to enable them to produce resources for the retailers to pass on to customers. Producers must be ethical and Christ-like in their dealings otherwise the industry will continue to crumble away. That’s a very helpful cost analysis, Mark: thank you: much appreciated. As Phil said, thanks Mark for that breakdown which makes sense of the £14.99 price label and can I just say that I really appreciate your openess and honesty. More importantly can I say I honour you for your fairness to retailers in that you offer a 40% Discount on the product, unfortunately the same cannot be said for most of the other music producers and in this respect just goes to show the situation up even more. I could understand, given the fact that you have only sold 750 copies, if you then did price promote your own product as this would not immediately lessen the value of your product anyway in the eyes of the consumer because it had previously been sold at the higher price, add to this given the 40% you give to the retailer this would still leave a margin to discount within the store as well if need be, therefore fair all round. The DTI’s Code of Practice for Traders on Price Indications (pdf, 242kb) must surely be relevant to what Kingsway is doing here, offering so-called reductions against their own prices. Where have the higher prices been charged by Kingsway? Is it legitimate for Kingsway to refer to the RRP when it’s their own prices being referred to? Lastly to clear up Phil Groom’s grumblings re my response to his ‘Kingsway removing stock from STL’ let me make it clear. At the time STL was for sale,we had not entirely decided to take back our own distribution although it looked likely that we would have little alternative. Neither did we know if the administrator would be hostile and lock down all our stock in the STL warehouse and so there was real need to ensure that we had stock of every title in Eastbourne to carry us through. However there was another very real reason that I was disappointed with Phil, and it was that any prospective buyer could have been dissuaded from even looking to purchase the STL distribution business if it thought that STL’s biggest customer was leaving………..while we had not yet made that decision, and though the thoughts of any prospective buyer would make no difference to Kingsway,….. it could very much have made a difference to a sale thus endangering jobs at Carlisle,…… and that was foremost in my thinking. I can only assume that Phil did not see this as a potential problem, and I was not about to explain it to him in a blog, thus in the name of ‘transparency’ he felt the need to advertise our activities to the world, something I felt was unhelpful in the midst of a dire situation. I will be pleased to see those who are interested in ‘discussion’ in July, I will advise Phil Groom of a suitable location in the absence of any other suggestion. I have raised all my issues face to face with Oli P last week and did ask him to feel free to relay them to you. competing only with those online, and sorry but I still find that to be a most naive if not disingenuous argument to say the least, with you in person when we spoke on the phone a number of months ago now. As you may remember I was most upset at the time due to having lost a number of sales to your online site when kingsway couldn’t/wouldn’t supply me direct during the STL and then relocation kerfuffle. Honestly please do feel free to visit me in Lincoln at your convenience or if more convenient to you do contact me directly by phone as I am more than happy to say everything I say on any blog directly to the person or organisation face to face or ear to ear as may be, as I only ever really say what I think regardless of venue or forum in person or in writing. As I said last time we spoke and I stand by now, I want to work with you and am willing to offer you any assistance I can, I want to be able to support you and assist you but I do need for you to work with me and not against me. So please do get in touch with me again and again thank you for taking the time to respond here. Time has not afforded me to comment on matters pertaining to internet and direct marketing but I have held strong views on this for many years and have found ALL my observations to suppliers have fallen on “death” ears. Simple maths shows that suppliers probably make less from an internet sale than from a retailer (greatly reduced cost of product, P&p, manning, maintaining the site etc). Their are differing percentages on this but I have heard it said that only 20% of sales are internet and 80% through shops and yets suppliers are throwing time, money at the internet and decreasing considerations to shops. Suppliers run scared of “missing out” on the market of the now/future and losing out to competitors. None have really looked at how they could still drive this way (internet) but “through” the shops (a whole gambit of things that could be done and at least good discussion should have been persued re this avenue) thus safe guarding the shop trade/business that is their lifeblood. At best suppliers have been very short sighted and nieve. The short term big buck by selling a quantity to say Amazon at a silly price which allows Amazon to sell BELOW what they sell it for, thus damaging their trading and the shops, which although it may bring money in quickly erodes at the very exsistance of the supplier and long term will potentially bring them to their knees (whole host of further potential points and discussion re this). Why can’t suppliers see this. Driving this way and their own internet market has already hugely eroded footfall into local shops and those that do come in are increasingly reluctant to part with £3/£4 or £5+ more than they would if going direct/online, however supportive and loyal they are to the shops. SUppliers actions also increase the liklihood that christian gift and card firms will no longer be able to survive. Less folkd into the shop less trade on these products and so on and so forth. I would say that the liklihood is that suppliers are throwing a huge amount of money at the internet and in doing so become increasingly “tied” to this, throwing more and more money at it and failing to see the actual DRAIN on their resources. I know one big “supplier” who did this and it sucked away in such a way that all other aspects of their business was “trimmed” to try and accomodate the cost. This lead to a spiralling down across the board in supply/service etc. One HUGE point (in my opinion). If the suppliers OWN their product THEY CHOSE WHO THEY TRADE IT THROUGH. THey create the issues when they sell to say, Eden, Amazon, Christianbits etc at reduced prices thus creating “price wars” on their product. If they don’t do this they can set a £14.99/ £12.99 whatever price and control the market. A friend of mine produced a book but would not sell to Amazon, Amazon showed it on their site (even priced it for 90p less than retail) but could never sell or fulfill those orders because they never had any. The book sold well AT ITS FULL PRICE, why, because the supplier controlled it. THis would never happen but, if we (the retailer)sent back ALL our Kingsway product and refused to trade until they sorted this they would have to take note. At the bottom line (and they won’t like this) christian suppliers are in many ways responsible for the decline and closeure of shops in this country due in greater part to the above mentoned. That may be seen as a bit sweeping and unfair but if we were to sit and disect/expand the above I think a very big case ca be made on this. It may be the horse has bolted but if we are to bring a measure of reverse to the trends re high street christian bookshops we need to find a way to “properly” address these issues and bring suppliers to book. I know the above is a bit long winded and probably not best written with plenty that could be expanded on, but I do believe they are important issues. Happy to discuss further with folks. Just a quick follow up thought on Internet sales and linking them to local shops. Todays technology would make it very simple to tie up any online purchase with the local christian bookshop.I would challenge any supplier on this. If your heart, as you often say it is, to support the local shops then show it by applying this to your websites. The argument of not wanting to give the credit to the wrong shop or how to determine this is just not true or valid. For the example I will use Kingsway and also bring into effect that they ALONE now supply their product. In effect if it is on sale at my shop for £12.99 that is the price online. An internet customer in Southwold purchases this item. Our shop is flagged as the local supplier (if two or three in close proximity they could tick ther choice, which removes the “who gets it” problem). Their could even be a link to the shop. They could even be offered the choice of picking it up in the shop with free vouchers for doing so (this can be offset re posting/packing admin costs save, their is a lot of scope potential here). If the customer has it posted, the shop picks up its percentage of the sale, maybe slightly reduced for the despatch costings but in effect a sale from the shop. Kingsways costs are not affected as the price is the same so all parties benefit. Not only this the shop has been placed in the customers mind. Promotions can be flagged that can be picked up in the shop or online. It becomes a total working together of both supplier and retailer and supplier is actually safeguarding one of its key trading areas. With this shops also are happy to promote Kingsways internet site thus potentially increasing Kingsways reach out into the christian market tremendously. Tip of the iceberg touching on this but DEFINITELY WORKABLE. Just to point out something to readers of your post: Christian Bits do NOT get any special rates from suppliers – we get the same discount deal as a “High street” Christian bookshop shop – we are treated just like one of you guys. In fact, our turnover is the same as one average high street Christian bookshop. Just wanted to make this clear in case readers think there is some preferential discounting going on.